CCBC BEST BOOKS FOR KIDS & TEENS 2013 PICK! This is a truly remarkable book! Captivating, it comprises a feast of double-page illustrations of outstanding quality, and prose of powerfully poetic strength. The dream boats and those they carry explore different seas, different worlds and different populatins. My only reservation centres on the publisher's suggestion that it is a book suitable for the 4 to 8 range. Some very young children will have happy encounters with this unique book, but, beyond doubt, many readers well beyond the age of 8 and well into mature adult years are likely to be entranced by what is presented here in both skilled language and intriguing illustrations. “I don’t have naps. I have adventures. I don’t sleep in a bed. I ride in a Dream Boat.” So begins Vancouver author Dan Bar-el’s delicious journey into the reveries of children all over the world. Marco is whisked away in a boat made of reeds to the Andes, where the stars guide him to his grandparents’ village for dancing and feasting. Kaia’s cedar canoe flies her to Haida Gwaii for a potlatch, while Ivan’s mighty frigate sails past the Bear Spirits to the realm of Baba Yaga and the Firebird. From Babatunde gliding along the waters of the Niger to Shenaz in her fishing boat being sprinkled with spray from Giant Ganesh’s trunk, these children all have their own vessels that take them away to lands of myth and memory. This is a gorgeous bedtime book. Bar-el’s poetic prose sweeps the reader along on the swish of the water and the wind that vaults the boats aloft. The vignettes about each child are interspersed with pages in which children representing diverse cultures meet and play together in the air. The highlights of the book are the beautiful illustrations by Kirsti Anne Wakelin. 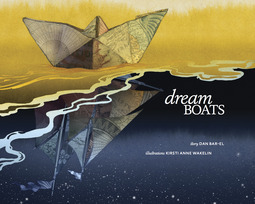 These double-page illustrations are, indeed, dream-like, whimsical, and do justice to the multicultural myths and folklore presented in Dream Boats. Children ride and glide in boats as they adventure through their dreams. From Marco in the Andes who sails through the constellations, to Kaia on the Northwest coast, who floats near the shores of Haida Gwaii and adventures with Eagle, Orca, Grizzly Bear, to Ivan in St. Petersburg who sneaks between the bony legs of Baba Yaga. "Dreamboats" takes readers into the dreams of children around the world, dreams that are filled with family and legends, culture and love. Written in lyrical prose by Dan Bar-el with gorgeous evocative art by Kirsti Anne Wakelin. Deakin Review of Children's Litearture: This is a gorgeously illustrated book which offers readers the opportunity to “float” in a dream boat, travelling deep into the richly-embroidered dreams of children from different lands and varying traditions. The words and images transport us high into the Andes and deep into the rainforests of Haida Gwaii; they take us to the beach in Mumbai and into the city of St. Petersburg; they float on the Niger and sail on the Yangtze.